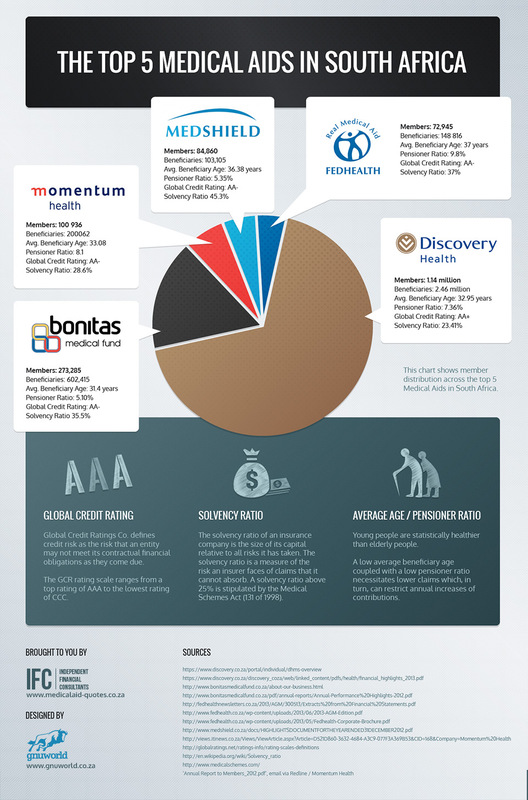 Jonas Meister and the Independent Financial Consultants team has done a bit of digging through the annual performance reports of the various open medical aids in South Africa for 2012 and put together an infographic which highlights how the 5 biggest schemes compare to one-another in terms of performance indicators such as membership and beneficiary numbers, solvency ratios, credit ratings and so on. The medical aid data they used for the infographic is for the most part available freely with a bit of searching online. You can see a list of sources listed at the end of the graphic. Essentially the majority of the open medical aid schemes produce fairly similar annual performance or annual financial reports for their members and the public at large. This data is provided by www.medicalaid-quotes.co.za. It’s interesting to note that Discovery Health is the biggest medical aid scheme in South Africa. Feel free to share this article with your friends on Facebook and Twitter. Remember: Sharing is Caring.